One of the first questions out-of-town home buyers ask of us is where to live in Tallahassee. Of course, this is not a question with a one-size-fits-all answer, so we recommend they start by using our Property Search Tool to start exploring some of the neighborhoods and their corresponding homes for sale. Another way to figure it out is to study where the most recent buyers have chosen to live when they choose Tallahassee, thus we often provide reports on the most active neighborhoods in Tallahassee. In the real estate graph above, the top selling neighborhoods for 2012 are shown. The only real interesting change I see from this graph versus the last time we showed it is that Southwood is not the top neighborhood in total sales. Now that new construction in Southwood has cooled, it will be interesting to see the pace of sales in the coming years. When we isolate the four quadrants of the Tallahassee real estate market over the past ten years, a clear picture of Tallahassee housing trends is quite clear. 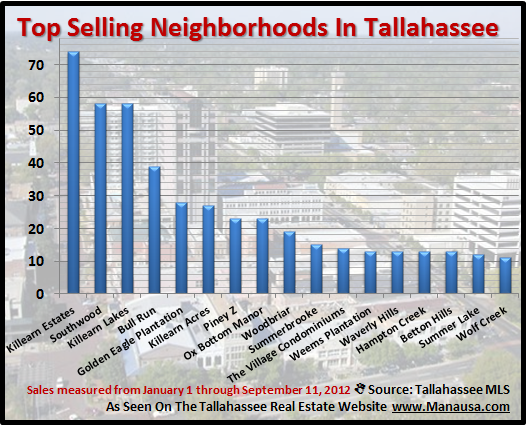 Other than Southwood in the Southeast, neighborhoods in Northeast Tallahassee have dominated home sales. 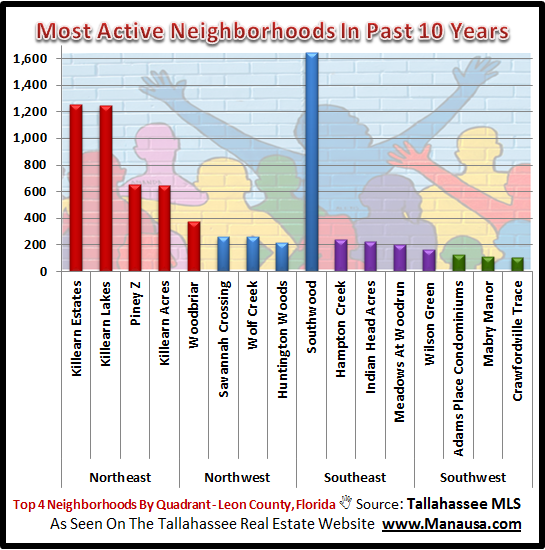 What surprises many newcomers to the Tallahassee area is just how many neighborhoods and subdivisions that we actually have here. Currently, there have been 1,676 home sales recorded in the Tallahassee MLS, and they have been posted to 506 neighborhoods. That is an incredibly low average of just three per neighborhood. In fact, nearly half of those neighborhoods have only posted one home sale thus far in 2012. If you would like to know more about a specific neighborhood, just click on the letter below that will take you to all the neighborhoods in Tallahassee that start with that letter. You can then choose to see any articles or market reports we might have produced for that neighborhood, as well as all of the homes currently listed for sale in each one. We hope our “Tallahassee Subdivisions index assists both resident and non-resident guests to our site. You can also use our Map Based Property Search Tool if you are unfamiliar with the Tallahassee area. If you ever have any questions about where to live in Tallahassee, just drop me a note and we can schedule a time to discuss your specific needs and what you are looking for in your new home.